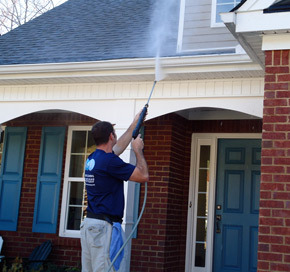 Pressure cleaning your driveway, sidewalks and vinyl siding is an important part of your home's maintenance, will prolong the life of your house, and looks exceptional when finished. Our equipment is safe and effective at removing mold, grime, and build-up on your property. We use low-pressure combined with a bio-degradable, non-toxic, plant-safe chemical on house washes to protect your vinyl, wood, or stucco. On brick, stone, or especially concrete patios and driveways our 4000 psi equipment will make great improvements. We carry liability insurance and our courteous, experienced staff will take special care to not damage your property. As with any other service that we offer, we stand by our work and have a 100% satisfaction guarantee. Contact ABI today for a pressure cleaning estimate.